Samsung today unveiled its two latest flagship smartphones, the Galaxy S7 and GS7 edge at an elaborate Mobile World Congress event in Barcelona. 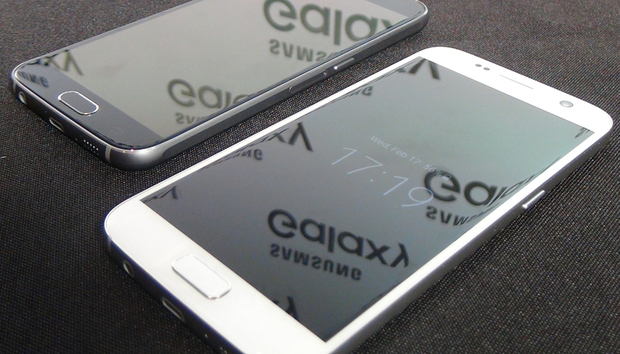 Rumors about the GS7 and GS7 edge hit the Web (hard) months ago. Many of the most widely circulated reports proved accurate. However, Samsung did keep a few surprises under wraps. I spent about an hour with both new Android phones last week at a media event in New York City, and I brought along my GS6 and GS6 edge+ for comparison. Of course, 60 minutes isn't nearly enough time to provide a full evaluation of a smartphone — let alone two of them — but a number of things quickly jumped out at me. The GS6, GS6 edge and GS6 edge+ all have 16MP cameras. The new GS7 and GS7 edge have 12MP digital shooters. So, you ask, why is a reduction in megapixels a good thing? Simply put, megapixels aren't everything when it comes to digital cameras, and at a certain point, the lens, aperture and shutter speed begin to carry as much if not more weight. The cameras on the new GS7s are the "first dual pixel sensor 12MP" smartphone cameras ever, according to Samsung, which means every pixel they pack is used to focus. That leads to quicker, more effective autofocus. Samsung says the GS7 cameras focus "two to three times faster" than the GS6 shooters. The GS7 camera aperture (F1.7), leads to 25 percent less exposure time than the cameras on the GS6s (F1.9), according to Samsung, which should result in crisper, clearer images. The camera pixels themselves are also larger in the GS7s (1.4μm) than the GS6 phones (1.12μm), Samsung says, and they take in more light and help capture quality images in dimly lit spaces. I know that's a lot of "Samsung says" and "according to Samsungs," but it's tough to test camera quality in a controlled environment. The company did, however, perform a demo in which it pitted a GS7 edge against an iPhone 6s Plus in a dark chamber to see which one focused faster and took better images without a lot of light. As you might expect at a Samsung event, the GS7 edge was the clear winner, and though I don't entirely trust Samsung's tests — and it remains to be seen whether or not the improved sensor makes up for that significant pixel reduction — they were encouraging. The Galaxy S6 was the first Galaxy S smartphone that didn't have a slot for expandable memory, and though this wasn't a deal-breaker for most folks, it was a disappointment for many. With the GS6, the company was drastically trying to increase the aesthetic appeal of the Galaxy S line (after a lukewarm response to the boring GS5), and decrease the thickness, and I suspect that had something to do with the decision to ditch the microSD card. Samsung reversed course with the GS7 and again included a microSD slot. The company also figured out a way to include the memory card while maintaining the GS7's svelte frame; the memory-card and SIM card slots on the GS7 are one and the same. The GS7 phones currently support memory cards up to 200GB, though Samsung says they could be updated to work with higher capacity cards as they're released. The customizable Always on Display can also use a motion sensor to wake the GS7 devices and display the date, time and message alerts; a calendar; or a personalized screen. And it has two different light levels so, for example, if you place the GS7 on your bedside in the dark, the Always on Display dims accordingly. Samsung has sold various water-resistant and ruggedized phones for years. It even makes a bulked-up version of the GS6, the GS6 Active, that's basically a GS6 with body armor. While the GS7 phones are not ruggedized like the Active, they are just as water-resistant. Samsung is careful to stress that while the GS7s are protected from water, they're not waterproof. The new phones have an International Electrotechnical Commission (IEC) protection rating of IP68, which means they offer "protection from contact with harmful dust" and are "protected from immersion in water with a depth of more than 1 meter," according to CNET. But you should by no means try to take underwater photos with a GS7 — or if you do, don't go crying to Samsung when your phone croaks. The curved displays on Samsung's edge phones are designed to provide quick access to information, apps and contacts. Not surprisingly, the GS7 edge has some new edge screen features. The edge panel now takes up more of the display when opened; it is 550 pixels instead of 256 pixels, or more than double the width of the edge panel on past Samsung edge phones. The larger size lets you view two side-by-side columns of apps or contacts instead of just one. And the new GS7s also shows certain information horizontally down the column so you don't need to hold the phone in landscape orientation to see it. You can also now place 1x1 app widgets from third-parties on the apps edge to trigger certain functions. For example, you could place a 1x1 widget from a Twitter app on the edge screen and use it to go directly to the new tweet function, instead of using the app's icon to open it and then navigate to the appropriate page. Both of the new GS7s have significantly larger batteries than their GS6 counterparts. Poor battery life is the GS6 edge's Achilles heel, and these larger power packs should address that issue. The GS7 has a 3,000mAh battery (which is about 18 percent larger than the GS6's 2,550mAh battery) and the GS7 edge has a whopping 3,600mAh battery (20 percent larger than the 3,000mAh GS6 edge+ battery). There is a downside to packing such large battery packs into phones, and I'll get to that in the next section, but they should also mean longer battery life. Like the GS6 and GS6 edge phones, the new GS7s support both Qi and PMA wireless charging standards. However, the new phones power up faster wirelessly — you can charge a dead phone to about half capacity in 30 minutes, according to Samsung … if you use an appropriate wireless "fast charge" accessory, such as the company's new wireless charge pad, which props the GS7 up at about a 40-degree angle, so you can see the Always On Display features. The Galaxy S6 edge+ fully charges wirelessly in about 120 minutes, according to Samsung, so the new phones should wirelessly power up about twice as quickly. There's a lot to like about these two new phones, but they're not perfect. Here are a few reasons why Samsung might have missed its mark with the GS7s. The GS7s both received battery upgrades, and that's certainly a good thing, but those larger power packs mean the devices are heavier than their GS6 and GS6 edge+ counterparts. The weight difference between the GS6 edge+ (153 grams) and the slightly smaller, yet still heavier GS7 edge (157 grams) is a just 4 grams. However, the GS7 (152 grams), which has the same size display and is actually a bit thinner than the GS6 (138 grams), is more than 10 percent heavier. And it's 15 percent heavier than the GS6 edge (132 grams). The weight difference between the GS6 edge+ and GS7 edge isn't particularly noticeable, but people who upgrade from the GS6 or GS6 edge to the GS7 will definitely feel some extra heft. The most notable design difference between the GS7s and the last generation Galaxy S devices is their curved back panels. Both edges of the GS7's rear side are curved, not unlike the GS7's edge display. The Galaxy Note5 had similar rear curves, and Samsung says it received a lot of positive feedback on the feature so it brought the curved panel over to the Galaxy S line. Of course, the majority of Galaxy S7 owners will immediately pop a case onto their phones, and they'll never think about the curved back panel again. The GS7 fingerprint reader and rear camera fixture are slightly different, though you have to look closely to tell. The finger scanner is boxy and less of an oval shape, and it doesn't stick out from the device's body as much, which is a good thing. The camera lens fixture is similarly slimmed down and doesn't protrude quite as far as the lens on the GS6. Though both of these features help decrease the devices' overall thickness, they don't feel different in hand — except for the extra weight, as mentioned above. The displays on the two new GS7 phones are also the same as the GS6 displays; the GS7 has a Gorilla Glass 4 quad HD, 5.1-inch Super AMOLED display (2560 x 1440 pixels, at 577 ppi), and the GS7 edge has a Gorilla Glass 4 quad HD, 5.5-inch Super AMOLED display (2560 x 1440 pixels, at 534 ppi). The displays on the last generation GS6 phones are great, and they're among the best on the market today, so this isn't necessarily a shortcoming. However, a screen upgrade is never a bad thing and would have been welcomed. The new GS7 phones support memory cards, but they're available only with one internal storage option: 32GB. If you don't want to purchase a memory card — or have to remember to carry one around in your wallet or purse — and 32GB of on-board storage isn't enough, the GS7s might not be right for you. Both new phones will be available in the United States via AT&T, Sprint, T-Mobile, U.S. Cellular and Verizon Wireless starting on March 11. The GS7 comes in black and gold, while the GS7 edge will be available in black, gold and silver. Preorders for the new smartphones begin at 8:00 EST on February 23. And you can learn more about Samsung's new GS7s on the company's website.